I was very fortunate to get my hands on the new Nikon 500mm f/5.6E PF lens. I’ll have a full review on that soon (hint: it’s amazing). I brought it due to its small size (only 3 lbs). Had I not brought it, my other choice was the 300mm f/4E PF Nikkor with TC-14EIII for a 420mm f/5.6 equivalent (plus the ability to crop in-camera with the D850). 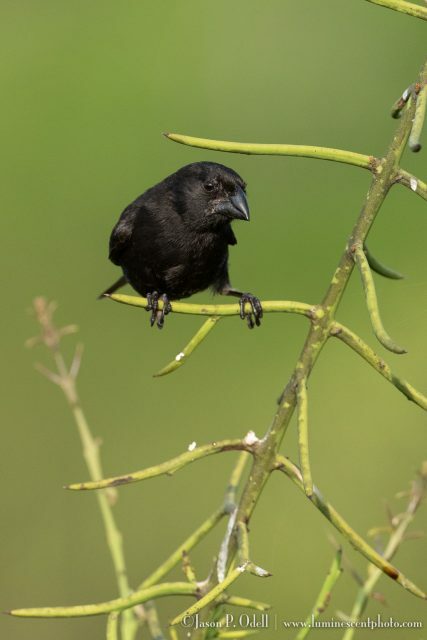 Galapagos medium ground finch. Nikon D850 with 500mm f/5.6 E ED PF Nikkor lens. Because I had this new lens, I purposely used it frequently. What the 500mm Nikkor lens allowed me to do was get shots that had better bokeh, such as this Galápagos penguin, and close-ups of smaller birds like the Galápagos finches. The only reason why this lens was feasible for this trip was that it’s incredibly small. I did not bring any camera supports (tripod/monopod) because quite frankly they’d have been cumbersome to use and would have made the panga landings trickier. 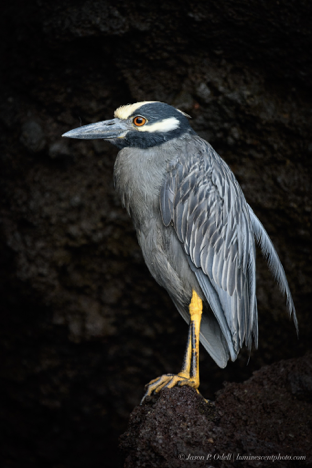 Yellow-crowned night heron, photographed from an inflatable panga boat using a Nikon D850 and 70-200mm f/4 AFS G VR lens. 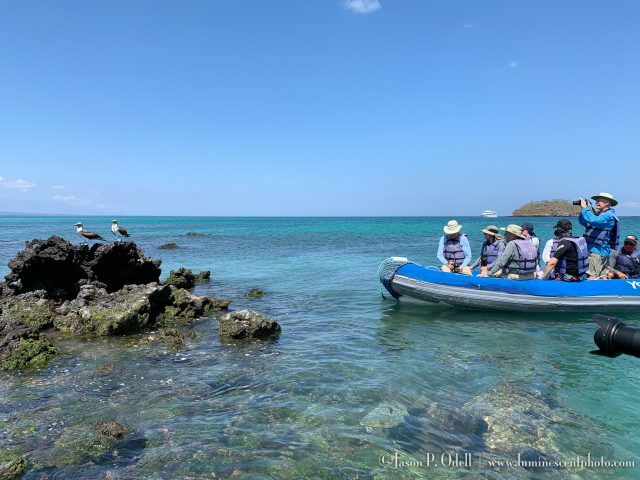 The most important thing about photographing wildlife in the Galápagos is to be able to easily hand-hold your lens and have a focal length reach of at least 200mm, with 300mm being preferred. I originally considered my 200-500mm lens, but at 5 lbs, it’s a beast to hand-hold and carry around all day. There are times where you’ll photograph wildlife from your panga, so a stabilized lens (VR/IS) is absolutely critical. Tripods and monopods are too cumbersome to use in most of the locations, and certainly impossible to deploy on a panga ride.